I’m back from Disney….had a blast and am now home and ready to get back into the swing of things. I’m sure some of you have already seen this set….it’s Gorgeous!!!! It’s called Everything Eleanor and will be available on June 1st with the new Catalog!! Ahhhhhhhhhhhh!!! I can’t wait!!! How about you??? Are you ready to get your catalog? If you don’t have a Demonstrator and would like for me to be your Demonstrator I will be happy to send one to you. Just let me know so I can get you on my pre-order list. 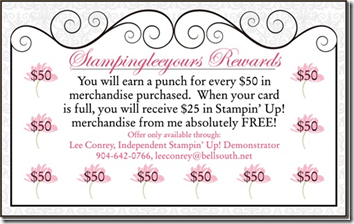 Email me for more details…..at leeconrey@bellsouth.net I’d love to hear from you. Don’t you want to be the first kid on the block with your new catty!!! I know I do!! There are just too many cool things I can’t even mention or talk about that you are going to want to see!!! It’s so fabulous!!! On another note don’t miss out on some of the super fantastic buys on the retiring stuff….check it out on my website. Some things are already gone so don’t delay. It will be gone soon. 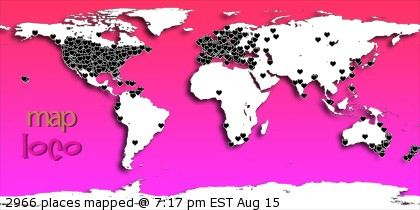 Thanks for stopping in….I’ll be back soon with some more fun ideas. Very pretty card...great new colors! Beautiful card Lee! Simple to do and very striking. Love the fun new shape for the sentiment!